"America is never wholly herself unless she is engaged in high moral principle. We as a people have such a purpose today. It is to make kinder the face of the nation and gentler the face of the world. My friends, we have work to do." With those words, made during his inaugural address in 1989, Bush ushered in a term during which he would preside over the end of the Cold War. His single term in office would coincide with the fall of the Iron Curtain and the collapse of the Soviet Union, and usher in an era of the United States as the world's lone superpower. Bush entered into a war with Iraq -- which had invaded neighboring Kuwait -- that would later come to be known as the "first" Gulf War, and forged a new strategic partnership with Russia that would include a major reduction of their respective stockpiles of nuclear weapons. Bush’s wide-ranging resume included being a decorated World War II veteran, oilman, head of the Central Intelligence Agency, a two-term vice president, ambassador to the United Nations and China, father of a president, and a confessed broccoli hater. Bush was also the United States' oldest living former president when he died. The U.S. flag at the White House was at half-staff early on December 1. Former President Bill Clinton praised Bush for his "great long life of service, love and friendship." In a statement issued early on December 1, Clinton, who defeated Bush in the 1992 presidential election, said he was always struck by Bush's "innate and genuine decency" and by his devotion to his wife Barbara and his family. Bush was born in Massachusetts in 1924 to a prominent family headed by his father, banker and U.S. Senator Prescott Bush. The younger Bush would continue the family's political lineage, serving twice as vice president under Ronald Reagan before becoming president himself, and fathering George W. Bush -- president from 2001 to 2009 -- and Jeb Bush, a two-term Florida governor who unsuccessfully ran to be the Republican Party’s candidate for president in 2016. Bush was educated at elite schools and enlisted in the U.S. Navy in 1942. At 18, he was the youngest Navy flier at the time, and would go on to fly 58 combat missions as a torpedo bomber pilot in the Pacific theater. On one of those missions, in 1944, his squadron came under heavy Japanese antiaircraft fire. With his plane ablaze, Bush managed to release his bombs and attempted to return to an aircraft carrier before he was forced to bail. He was rescued after floating at sea for four hours, and won a Distinguished Flying Cross for his bravery in action. After his military service, Bush attended and graduated from Yale University. He married Barbara Pierce in 1945, and about that same time entered the oil business in Texas. It was not until two decades later that he would enter politics. He was married to Barbara for 73 years, the longest marriage of any U.S. presidential couple. His wife -- considered one of the most popular first ladies in U.S. history -- died in April 2018. Bush lost two bids for a Senate seat and won one in the House of Representatives before attracting the attention of President Richard Nixon, who named Bush to be U.S. ambassador to the United Nations. Nixon's successor, President Gerald Ford, named Bush as CIA director in the aftermath of the Watergate scandal. 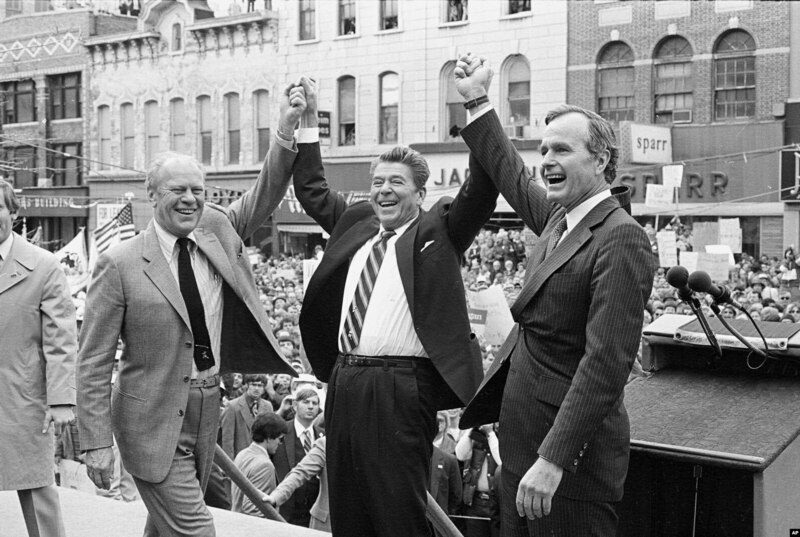 In 1980, Bush sought the Republican nomination for president but lost to Reagan. Bush was added to Reagan's ticket as vice president despite lacerating attacks on Reagan's supply-side fiscal approach to the economy labeled by Bush as "voodoo economics," and the two would go on to beat incumbent Democrat Jimmy Carter and serve two terms together. During his run for the presidency in 1988, Bush famously characterized "liberal" as a word so horrible that it could not be uttered. Instead, he called his liberal opponents "the L-word." He also famously issued a campaign promise he would fail to keep when he said: "Read my lips: No new taxes." As president, Bush's devoted considerable attention to foreign affairs, especially as the Soviet Union was showing signs of collapse. Sensing the U.S.S.R.'s grip was failing, Bush enunciated a vision of the direction the world was taking after more than 40 years of Cold War. "The totalitarian era is passing, its old ideas blown away like leaves from an ancient, lifeless tree," he said during his inaugural address. "A new breeze is blowing, and a nation refreshed by freedom stands ready to push on. There is new ground to be broken, and new action to be taken." Eventually the Soviet Union did break up, and Bush worked to help bring about what he called a "new world order." He worked to foster Western-style democracy in former communist-dominated states and integrate them into the global economy. Despite his international successes, issues at home combined to deny Bush a second term. Most prominent was his agreement in 1990 to raise taxes in order to cut the federal budget deficit, despite his earlier pledge at the Republican National Convention. This alienated many of his supporters while Democrat Bill Clinton, the youthful governor of Arkansas, used a sluggish economy to his advantage, portraying himself as the champion of the common man while making his opponent look as though he didn’t understand the plight or ordinary Americans. “It’s the economy, stupid,” Clinton aide James Carville repeated over and over again until it became a mantra of the campaign and the start of Bush’s downfall. In the end, Bush lost his reelection bid to Clinton in 1992 and became embroiled in controversy as he prepared to leave office. Just 28 days before Clinton’s inauguration, Bush ordered clemency for six people, including former Secretary of Defense Caspar Weinberger, for their role in the Iran-Contra affair that occurred under Bush’s predecessor, Reagan. The move drew fire from many critics of the affair, which involved the clandestine sale of arms to Iran via Israel in exchange for the release of American hostages held in Lebanon. Money from the sale was then secretly diverted to Contra rebels in Nicaragua who were fighting at a time when Congress prohibited such support. Four of those pardoned -- Clair George, Alan Fiers, Elliot Abrams, and William McFarlane -- had been convicted or pleaded guilty to charges in the Iran-Contra affair, while Duane Clarridge, like Weinberger, had been awaiting trial. After leaving the White House, Bush became a low-profile ex-president, refusing many speaking engagements and rarely making public pronouncements. The conservative wing of the Republican Party, meanwhile, put the blame on him for Clinton's victory and prevented him from playing a prominent role in the party. Eventually, Bush and Clinton combined their public influence to foster social and cultural issues, and the two served as goodwill ambassadors overseas. Together, the two former presidents from opposing parties helped generate aid for the victims of the tsunami of December 2004 and for victims of Hurricane Katrina in the southern United States in September 2005. Bush suffered from vascular Parkinsonism, a form of Parkinson's disease that forced him to use a motorized scooter or wheelchair after 2012 or so. But Bush also remained physically active at ages when many people have long since slowed down. He made a number of parachute jumps after retiring, including to celebrate his 75th, 80th, and 90th birthdays. He announced his final leap, on his 90th birthday in 2014, on Twitter, and pulled off the tandem jump near his beloved summer home in Kennebunkport, Maine, with flying colors. Despite gestures of goodwill and working toward helping others, Bush’s final years were tarnished by accusations late in 2017 that he sexually harassed at least seven women. Officials representing Bush issued apologies for the incidents, saying his behavior was an attempt to make light of social awkwardness posed by his own physical disability during photo sessions. No criminal charges were filed because of the allegations.